This collection consists of records relating to H.R. 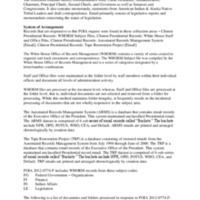 1977 – Department of the Interior and Related Agencies Appropriations Act, 1996. The act provided appropriations for the Department of the Interior, Department of Energy, the Forest Service (Department of Agriculture), Indian Health Service (Department of Health and Human Service), and other smaller agencies. President Clinton vetoed the bill on December 18, 1995. The collection contains correspondence, mostly from Tribal Presidents, Administrators, Chairmen, Chiefs, governors, senators, and congressmen. The files also contain memoranda, statements, and email.